Twenty-five hundred long and volatile years had passed since Bhagwan Mahavir conquered the ocean of materialistic existence and attained the everlasting bliss of liberation. Much had changed in these passing years. Most of all the true essence of religion and spirituality had been obscured by blind ritualistic practices and dogmatic misinterpretations of the canons. Religion was burdened by countless warring factions and the greed of the fanatics had made society succumb to practices led by fear. At such a time was born a beacon of hope: Param Krupaludev Shrimad Rajchandra. He would live for no other reason but the deliverance of sincere seekers. In his short but divinely productive life, Shrimad Rajchandra unearthed the essence of Jainism that had long been lost in the sands of time. He set about a new spiritual revolution that rekindled the passion for spirituality amongst countless souls. He was an everlasting fountain of divine nectar, and seekers from far and wide managed to quench their thirst with a few drops of his loving compassion. Shrimad in his own words had been a seeker for many a lifetime. The inner revolution in his life began at the young age of seven when he recollected his past lives whilst enraptured in deep contemplation. In his early twenties there came an inflection point in his spiritual ascension thanks to an opportune meeting with Shree Saubhagbhai of Sayla. It was as this momentous encounter had been orchestrated by a divine conspiracy of the universe itself so as to benefit numerous seekers. Saubhagbhai passed onto Shrimad an ancient and esoteric technique of meditation known as ‘Sudharas’. It was on meeting Saubhagbhai that Shrimad remembered the technique of remaining still in pure awareness. For this he remained indebted to Saubhagbhai throughout his lifetime and would fondly address him as his spiritual soulmate. Their spiritual intimacy has impacted Shrimad’s vast literacy legacy. It is rare indeed for any elevated divine master to leave behind their intimate and detailed thoughts. They usually leave behind esoteric poetry and aphoristic scriptures, if anything. Fortunately for us, Shrimad laid out the path to Self-realisation and Moksha, as well as openly sharing his innermost experiences in over 250 letters to Saubhagbhai. Even Atma Siddhi, Shrimad’s great poem, which is itself an independent scripture, was dedicated to Saubhagbhai, containing three references to him. It was Shrimad’s spiritual relationship with Saubhagbhai that illuminated the path and kept the thread of truth unbroken. It led to the creation of a whole lineage of enlightened souls in Sayla that has kept the flame of spirituality alive to this day. Seven years after this divine meeting, as Saubhagbhai lay on his deathbed, Shrimad wrote to him three powerful letters filled with all his love and compassion that eventually led Saubhagbhai to distinctly experience the soul as above and beyond the materialistic body. Shortly after his return from England, Mahatma Gandhi met a young man of 25 in Mumbai who was to have a profound influence on his life and philosophy. To quote Gandhiji: “Since that day onwards till the death of Raichandbhai, ours was a very close contact. Many times I have said and written many times that I have learnt much from the lives of many a person, but it is from the life of poet Raichandbhai, I have learnt the most” and “I must say that no one else has ever made on me the impression that Raichandbhai did”. Raichandbhai, to be known as Shrimad Rajchandra, composed the ‘Atma Sidhi Shastra’, a composition of 142 stanzas explaining the Jain path to liberation (Moksha), one night in Nadiad in just 90 minutes. This highly spiritual composition is also considered Classic Gujarati Literary work. So who was the self-realised Raichandbhai who had such impact upon Gandhiji, and in consequence the whole world? Was he just a poet, a dealer in precious stones, or a spiritual genius? Ravjibhai (from a Vaishnav background) and his wife Devbai (from a Jain family) lived in the small port of Vavania near Morbi in Saurashtra, India. They were a devout couple who served the community with much love and in 1867 they were blessed with a son whom they named Raichand. Raichand was later to be known as Shrimad Rajchandra and considered to be Gandhiji’s spiritual mentor. It was from him that Gandhiji learnt the height of compassion for all living beings, even an enemy! Shrimad’s mother was a model of humility and service such that, even though the family’s financial position was poor, Devbai continued to serve monks, saints and all visitors to her home with the same generosity and affection. Raichand was atypical right from childhood. While most toddlers are fidgety, he would sit peacefully still as a statue, for an hour or more, when he accompanied his mum to her friends. Once when asked to chop some vegetables he had tears in his eyes, not because he was being deprived from playing outside, but because he saw the life-force even in vegetation. Thus he exhibited sensitivity and mindful awareness even as a child. His spiritual leaning was accompanied by a great appeal for bhakti, accompanying his father to bhajan sessions and he had even bound a Kanthi, a symbol of devotion to Lord Krishna. Initially he was put off by the ‘atheism’ of Jain teachings but gradually as he came into contact with Jain scriptures such as the works of Kund Kund Acharya and the Pratikraman Sutra, which details analysis of compassion towards all life and the avoidance of violence, his affection for Jain teachings grew. When he was only seven, an elder and fond friend, Amichandbhai, died of a snake bite. Being inquisitive, Raichand inquired into the death and was told that the ‘life’ had passed out of Amichandbhai, and that, as he would no longer speak or do anything, he would be cremated. The 7-year-old clambered up a tree near the cremation ground and watched the proceedings. As he pondered deeply about what he saw, and wondered why someone would cruelly burn a man, suddenly he felt as though a veil had been removed. It is at this point he experienced ‘Jati Smaran Gnaan’, knowledge of past lives. Re-incarnation had now become a direct experience for him! A small temple stands today at the site of the tree, although the tree itself no longer stands. Though he started school late at the age of seven, he mastered the preliminaries of Mathematics in a month. Commanding great respect from fellow students and teachers, he was even allowed to conduct a class under the teacher’s supervision. He used his photographic memory extensively, remembering the lessons at one reading. Even at this early age he showed great determination and commitment, completing the curriculum of seven standards in just two years. He started his career in poetry early at the age of eight, writing about a thousand stanzas in the first year and composed poetry on the classics ‘Ramayana’ and ‘Mahabharat’ when he was only nine. Already contributing articles to Newspapers and Magazines from the age of eight, he wrote 300 stanzas on ‘A Watch’ at twelve. Being the recipient of numerous prizes for writing essays and poetry, he was well regarded as a great poet and scholar. One of his very early poems of a patriotic nature is sung in schools in Gujarat even today. Having demonstrated a clear comprehension of his goal in life Shrimad’s formal education ended at the age of twelve when he started attending his father’s shop. While tending to the shop he composed many poems on the heroic and spiritual life of Rama and Krishna, all the time maintaining a fully attentive, honest and conscientious service to his customers. His progressive social thinking for his times is demonstrated in the composition, at 16, of the book ‘ Stri Niti Bodhak’ – an early book on the issue of women and society. During much of his early life he had a great thirst for spiritual knowledge. Those who came into contact with him, often much older than him, were impressed by the depth of his understanding and scholarship. He was only 16 when he composed a book explaining simply and lucidly the essence of Jain teachings. He also composed the Mokshamala (Rosary of Moksha) of 108 lessons which even today provides wonderful insights into a true spiritual life, Jain teachings and the meaning of certain practices. Even today it provides inspiration to thousands of aspirants. Blessed with an photographic memory and a disposition of determination and commitment, he had already demonstrated extraordinary talents before he was introduced to the art of ‘Avdhan’ – attending to multiple activities simultaneously. Within a couple of days Shrimad was performing, in public, the feat of attending to 12 and then to 52 different activities. Eventually, still aged only 19, he increased this to 100 and was publicly referred to as ‘HIND NA HERA’, a ‘Diamond of India’. These various feats are widely recorded in newspapers and other publications. He was even invited by the British rulers of the time to demonstrate his skill in the UK, but Shrimad declined, indicating that he had a far higher quest. Thus at the age of twenty Shrimad put an end to his various public performances. With growing disinterest in outward show, he began retreating inwards with great awareness. He was often consulted on spiritual matters and even monks used to seek his guidance, despite his outward appearance as a businessman and a householder who had not taken up renunciation. His spiritual pursuits grew ever deeper and he realised that he was missing a key element in his striving. It was through Pujya Saubhagbhai’s benefaction that he found this ‘elusive key’. Saubhagbhai Lallubhai Sheth of Sayla had heard much about Shrimad and considered him a highly accomplished man, even though Shrimad was 44 years his junior. He wished to pass onto Shrimad the sacred knowledge known as Beej Gnaan which his father had learnt from a monk in Marwad. Shrimad had a premonition of his coming and greeted Saubhagbhai by name as he approached, even though had never met before! To his further astonishment, Shrimad had written a note in advance of this meeting, detailing Saubhagbhai's purpose. 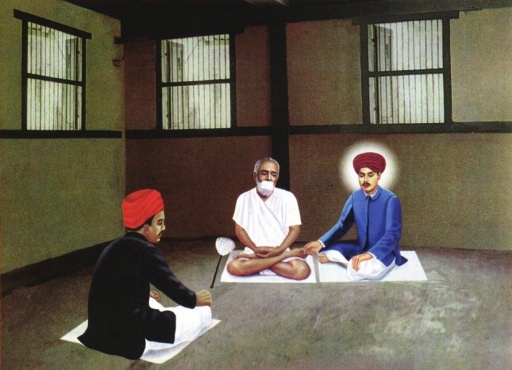 Saubhagbhai was convinced of Shrimad’s exalted spiritual status and immediately considered him as his Guru. Shrimad reciprocated this feeling towards Saubhagbhai who had revealed the ‘elusive key’ to him. Since this meeting, Shrimad’s spiritual progress gained considerable momentum. There remained great intimacy between the two, their relationship growing on a consistent spiritual base to the extent that they were known as soul mates. Shrimad repeatedly writes of his longing to meet Saubhagbhai, his letters always portraying high respect for Saubhagbhai. In these intimate letters we can see a great deal of the path to enlightenment and its practical aspects. Shortly after meeting Saubhagbhai, as if a secret door had opened, Shrimad attained Samyag Darshan on Kartik Sud 14 Vikram Samvat 1947, which is in 1891 CE. This blessed state is known as Self- Realisation, True Perception, First Awakening, Experience of the Soul. Shrimad wrote: “That my soul has attained complete knowledge of its nature is an indisputable fact, that my knots of the heart and head have been removed, is a truth of all times and all Self-realised souls will easily recognise and endorse my experience.” From this moment his writings are imbued with real experience of the soul’s innate bliss and he is propelled inwards. He constantly attempted to bring those around him onto the path of inner happiness. Shrimad's continuous outpouring of wisdom by means of letters and personal meetings with Saubhagbhai enabled him to develop such a spiritual state that Saubhagbhai attained Samyag Darshan. Shrimad constantly referred to anything he taught or explained as that which originated from the Tirthankars or other Gnanis, never claiming a teaching to be his own. He points out that detachment, renunciation and scholarship are fruitless without Samyag Darshan, and Shrimad has often said that to obtain Samyag Darshan one needs a true, self-realised Guru. Honouring a request by Saubhagbhai, Shrimad composed the Atma Siddhi Shastra within 90 minutes in the town of Nadiad. This composition of 142 stanzas explains the Jain path to Moksha. Besides being highly spiritual, it is also a Classic of Gujarati Literature and has been the subject of numerous translations and commentaries, and is also studied at universities for doctorates in philosophy even today. People were drawn to him by his publications and they even communicated through letters. Indeed it is through his letters compiled in a volume called ‘Shrimad Rajchandra’ also popularly known as ‘Vachnamrut’ that we have come to know his message, his inner thoughts and a glimpse into his spiritual state. As these letters were written to intimate acquaintances, they were always very personal and honest. While at times being compassionately stern, guiding the reader away from materialism, they also offer much practical spiritual advice. Shrimad met some monks who were deeply impressed by his understanding of the scriptures when he visited Khambat in about 1891. One monk, named Lalluji Maharaj, later known as Laghuraj Swami, had already heard of him. 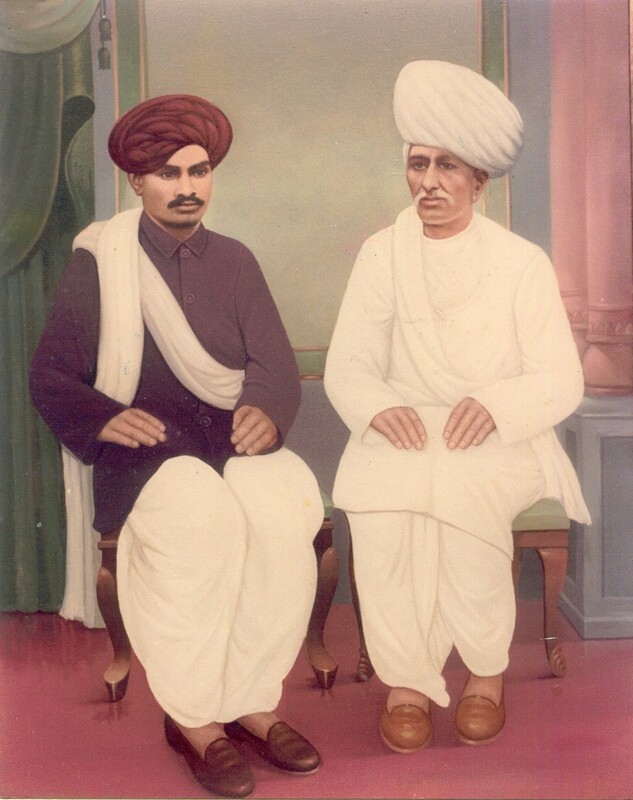 He later became the founder of the Shrimad Rajchandra Ashram at Agas. Despite him being a monk and Shrimad a householder, Laghuraj Swami was devoted to Shrimad. He was not ashamed of paying homage and bowing down to Shrimad, but Shrimad discouraged this. Laghuraj Swami had whole-hearted faith in him, just as a true disciple should have in a true Guru. There is much to be learnt from Laghuraj Swami and from the correspondence and instruction he received from Shrimad. It was for Laghuraj Swami that Shrimad had composed the ‘Letter of Six Fundamentals’ (Chha Pad No Patra). Shrimad retired early and was ready to renounce the world (take Diksha) but, poignantly, was afflicted by a severe illness which prevented the realisation of this vision. During his illness he kept to the study of religious texts which is reflected in his letters. Because of his love for the teachings and his longing for a spiritual revival, he continued to spread the message to monks and householders despite his ill-health. That he would work so hard despite being weak due to illness speaks volumes for his compassion! Even though he was so weak that he could not even sit up by himself, he was totally alert and aware. Finally, at age 33, on Chaitra Vad 5th VS 1957 (9th April 1901 CE) at 8:45 AM, after requesting his brother Mansukhbhai to take care of their mother and completely detaching himself from the outside world, he withdrew within and passed away at 2 PM.